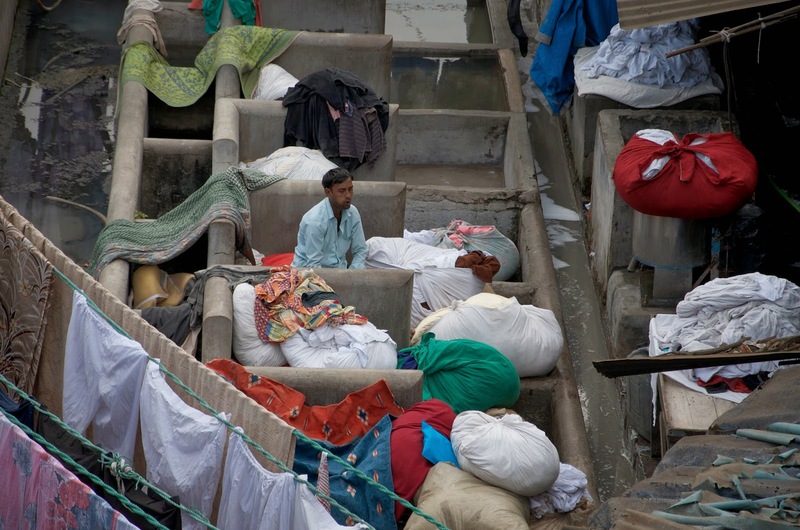 My photography group recently went on a fascinating excursion to Dhobi Ghat - the 'World's Largest Outdoor Laundry'. If, you think that the words 'Outdoor Laundry' suggest an al-fresco group of giant washing machines that swirl foaming suds to get that 'bluey white-ness', then you'd be wrong. 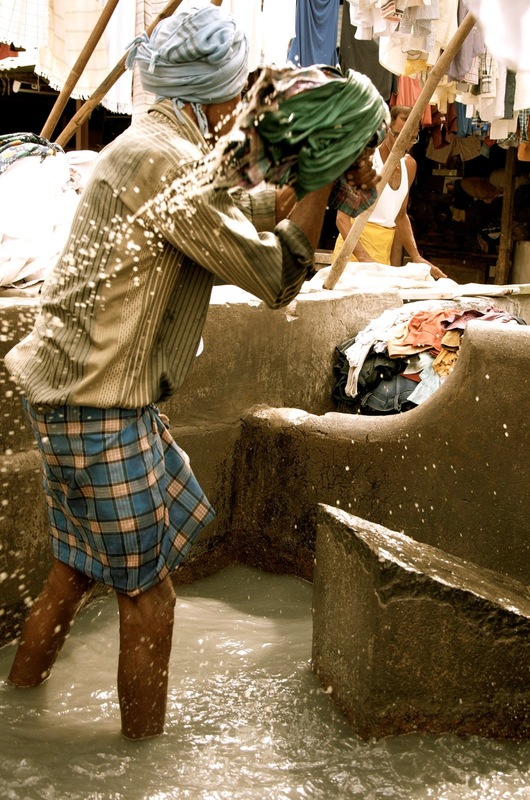 The Dhobi Ghat is, in fact, a large area comprised of hundreds of concrete troughs in which men (young and old) stand up to their knees in soapy water, bashing the life out of dirty linen. 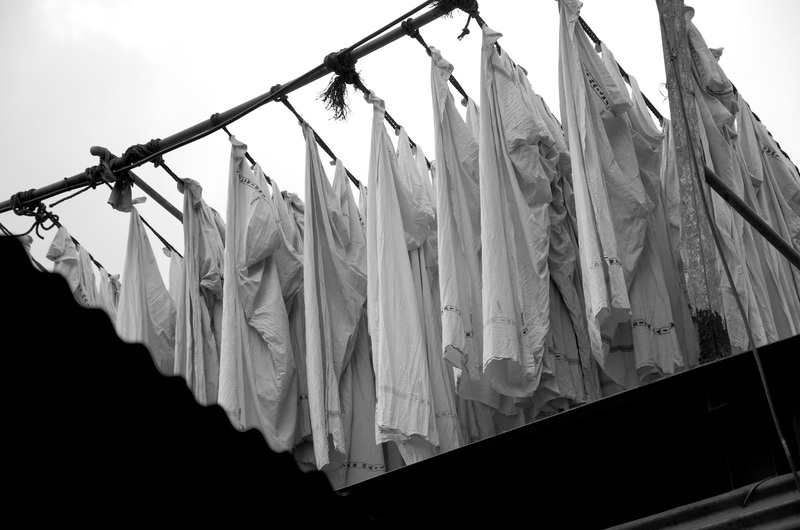 There is a relatively small amount of automation - the occasional tumble drier (very useful in the monsoon I should think) but apart from that - all washing is hung out to dry on the miles of washing line that hangs above the Dhobi Ghat washing area. Inside the covered areas, you will find men in flimsy vests, using Victorian-era irons filled with hot coals pressing the laundered items. And more men doing the folding. 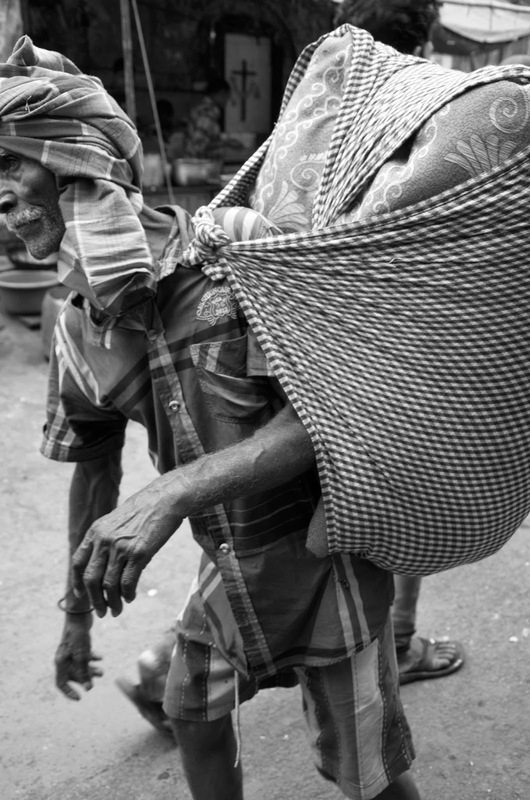 In amongst all of the action, are porters hauling-in and hauling-back-out, huge piles of washing. 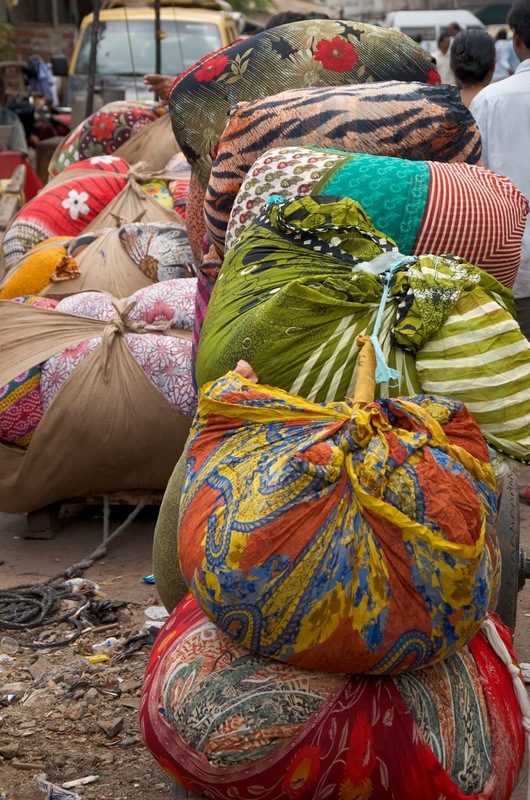 Methods of transport include by foot - with laundry bundled into giant sacks on their backs; or on the racks of Hercules bicycles; or piled up on handcarts, which are then dragged half way (or whole way) across the city. 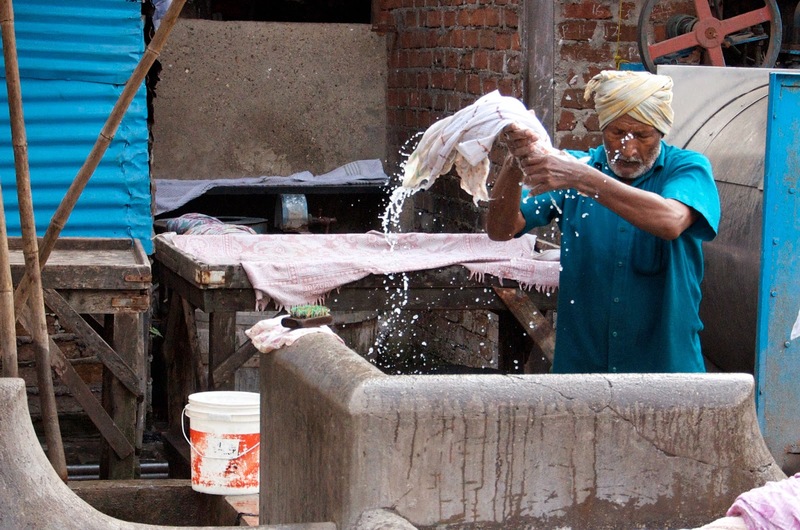 We were told that 250,000 individual items of linen are washed here everyday. To me, that's incredible! 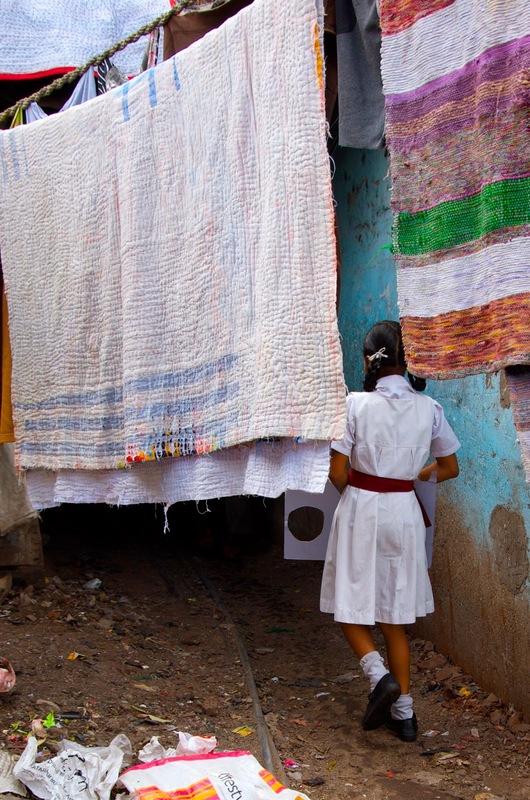 On a daily basis, Mumbai's hotels send their bedlinen to the Ghat; hospitals send in staff uniforms and sheets from their operating theatres; posh spas send their towels; and individuals send their household's dirty clothing. 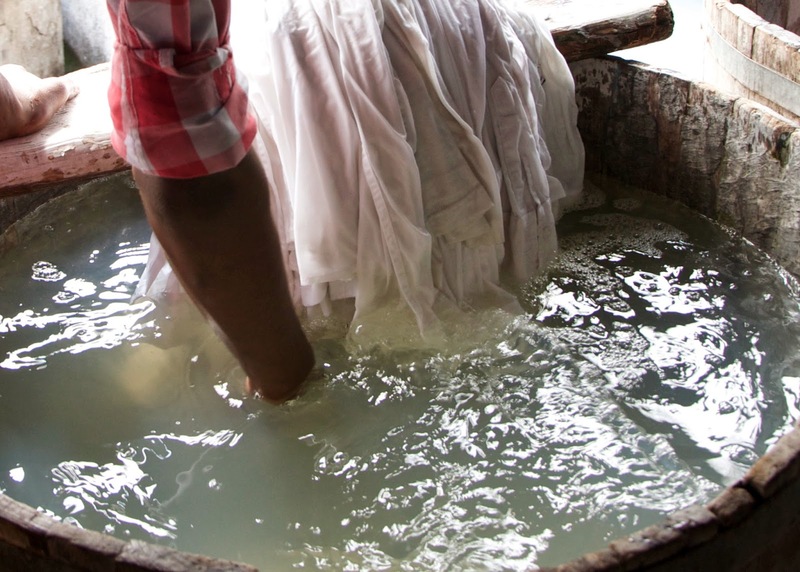 Some of the big clothing manufacturers even send brand new stock here to be washed so that the dies can be set. 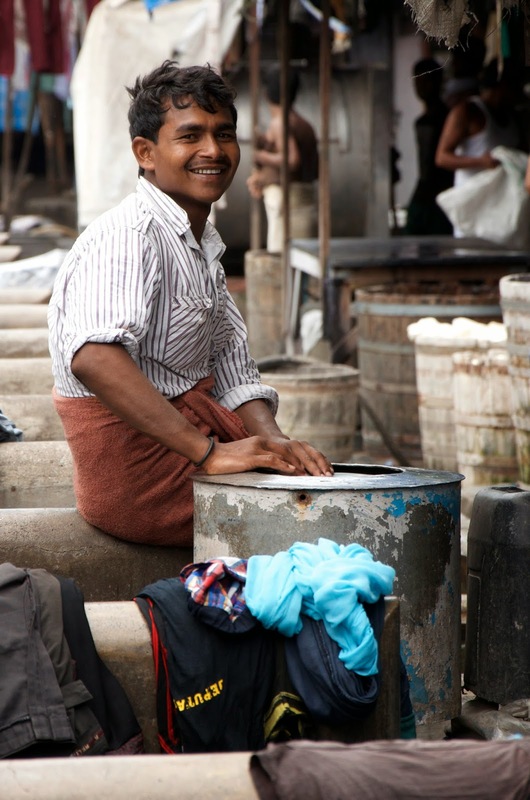 The Dhobi (which translates as 'washerman') is a caste group who are specialists in washing clothes - the job is hereditary. 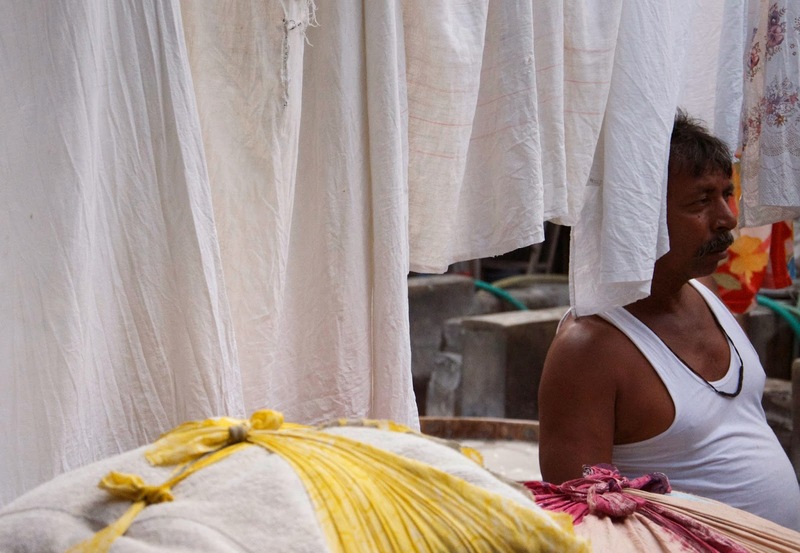 There are about 731 of them working in the Dhobi Ghat. 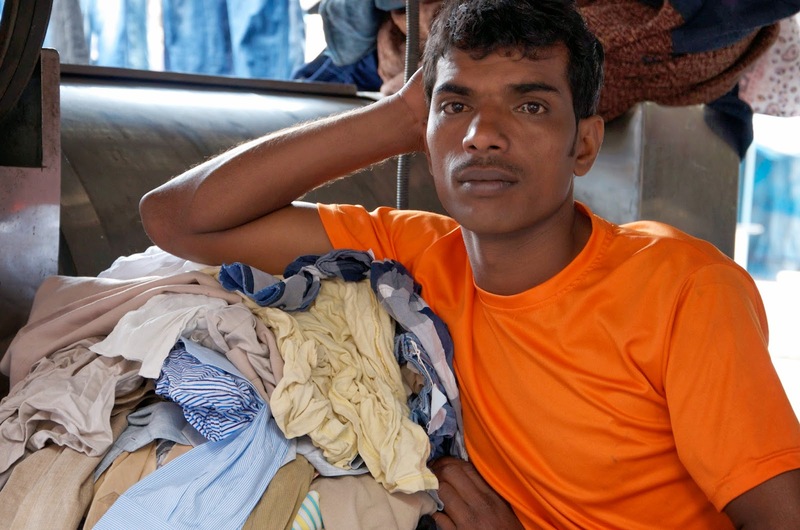 These washermen are mostly migrants from other parts of India - who live in situ with their families. 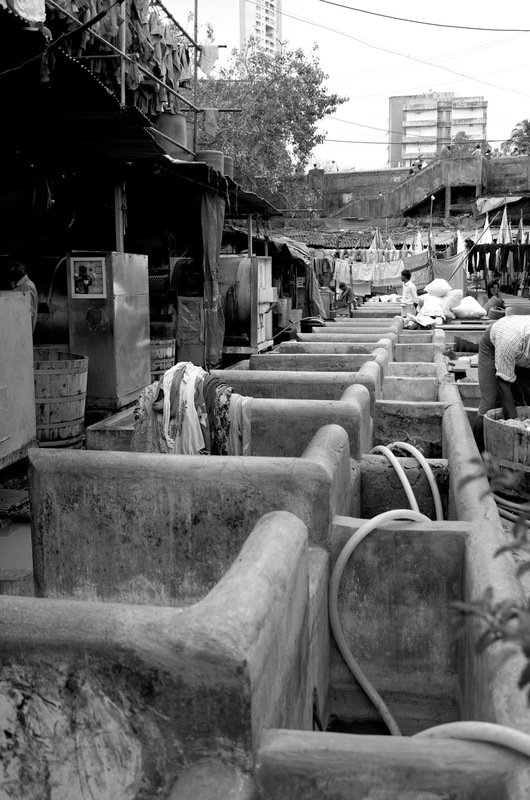 The Dhobi Ghat - a registered organisation itself - was built in 1890 to service the English and Parsi population of the city. 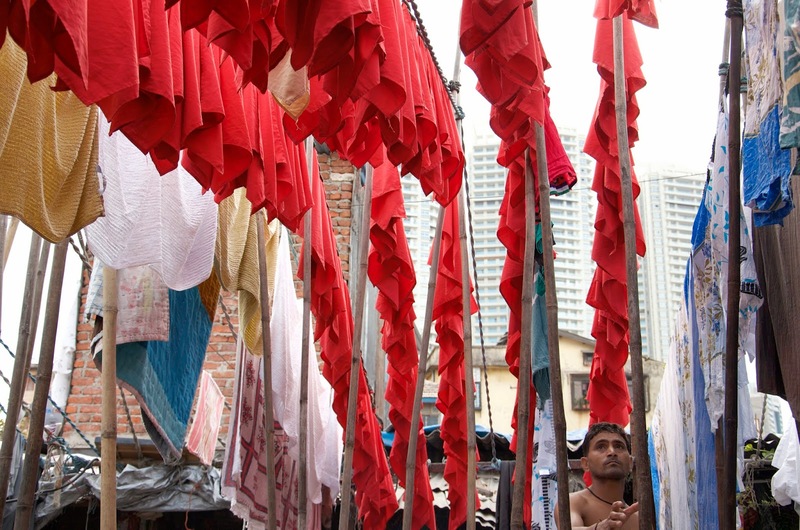 The laundry is now owned by the dastardly BMC (municipal council) which charges the workers rent and the maintenance costs of the troughs ('ghats'). I have read here that the BMC does little in return for the [what have been described as outrageous] charges - by not providing utilities and not clearing away rubbish [as is typical!]. 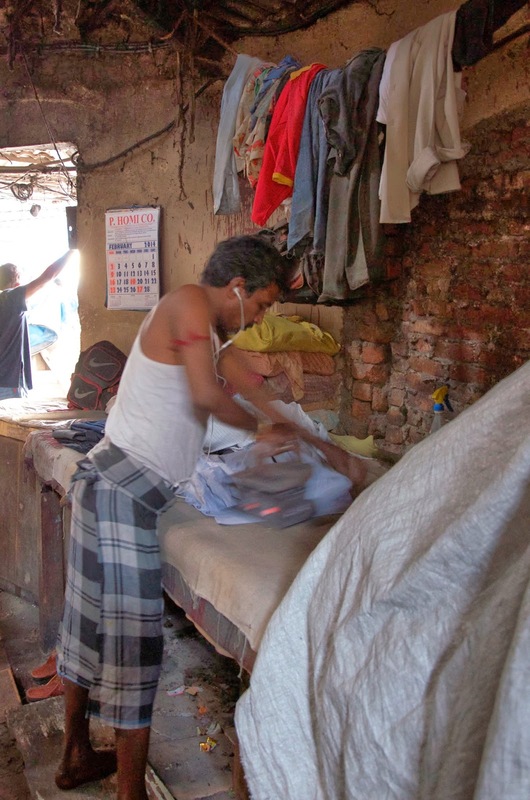 The laundrymen scrape a living from their profession - a few rupees is all it costs to wash a large item of linen and from this they must pay all their family's living expenses, as well as sending money back to their villages. 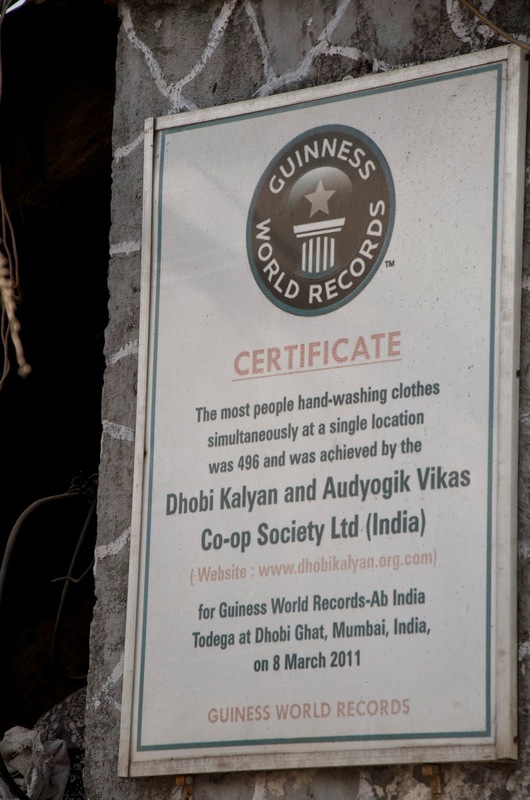 As you enter the laundry - you will see a sign that proudly announces the organisation's appearance in the Guinness Book of Records - for the largest number of people simultaneously hand-washing clothes at a single location (496) in 2011. 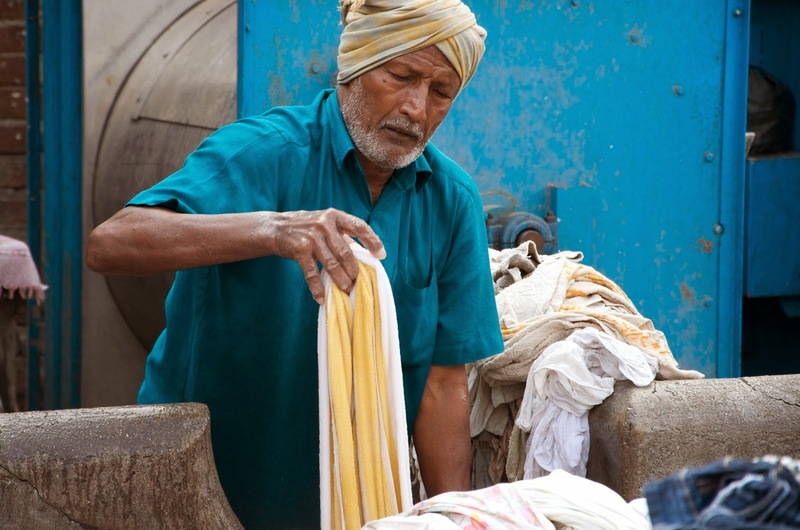 A trip into the Dhobi Ghat really is a fascinating insight into a profession that is experiencing so little modernisation. 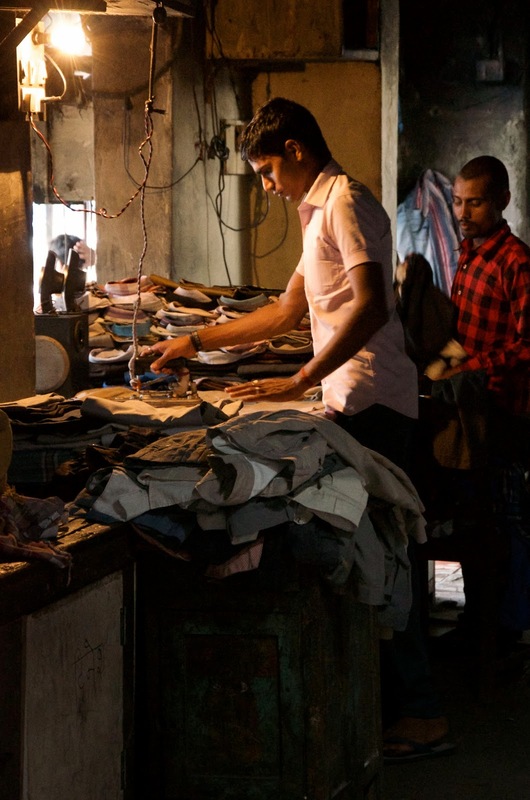 To see clothes being thrashed against a flogging stone and linens being pressed with Victorian irons is strange against the backdrop of hi-tec, hi-rises being built just behind the living quarters. 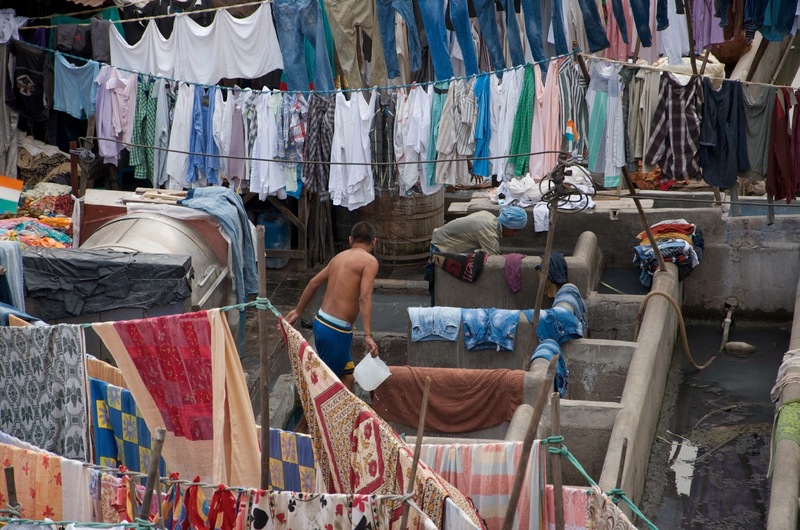 But then again - the Dhobi Ghat is so typical of the contrasts that Mumbai is famous for. Of course, if high levels of automation were to be introduced, then hundreds of people would be done out of their jobs. No need to be too efficient eh? 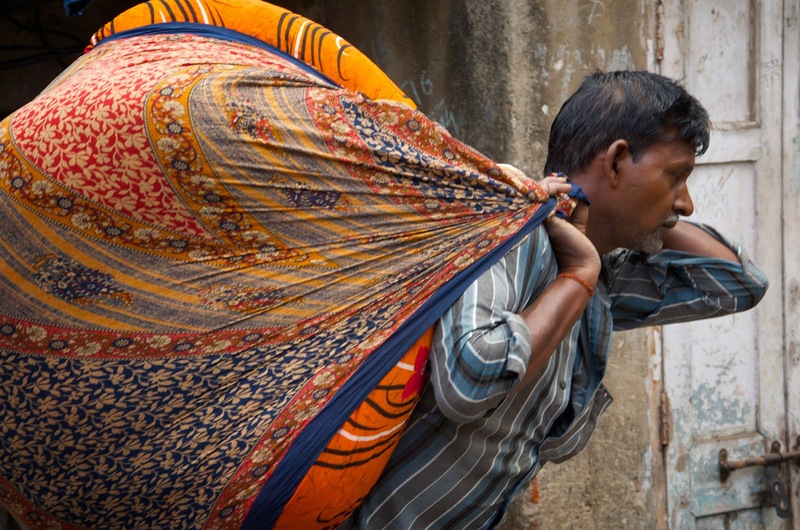 A family member helps to pick through saris prior to washing. Not sure I would call these bedsheets 'whiter than white'! I hate to think what standing in soapy water all day long does to your skin - hope he uses plenty of moisturiser! 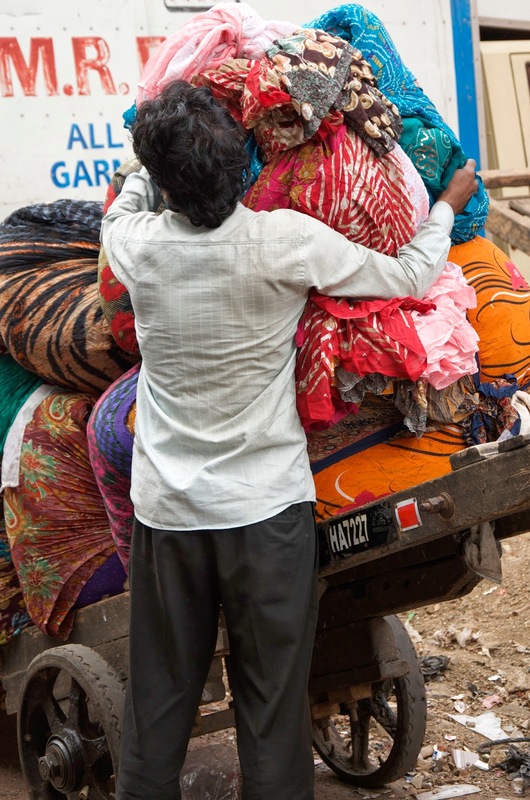 Piling bundles of laundry on to handcarts. 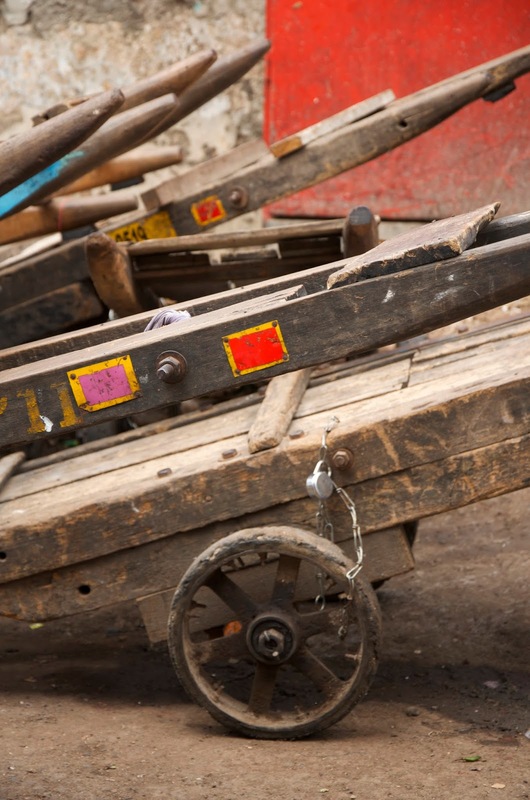 Artistic shot of handcarts...well it was a photo outing! You're going to cram HOW MUCH into that tumble drier? Ironing with only a single bulb for light. Love this photo - a guy wearing an Ipod presses clothing with a Victorian iron fuelled by coal! 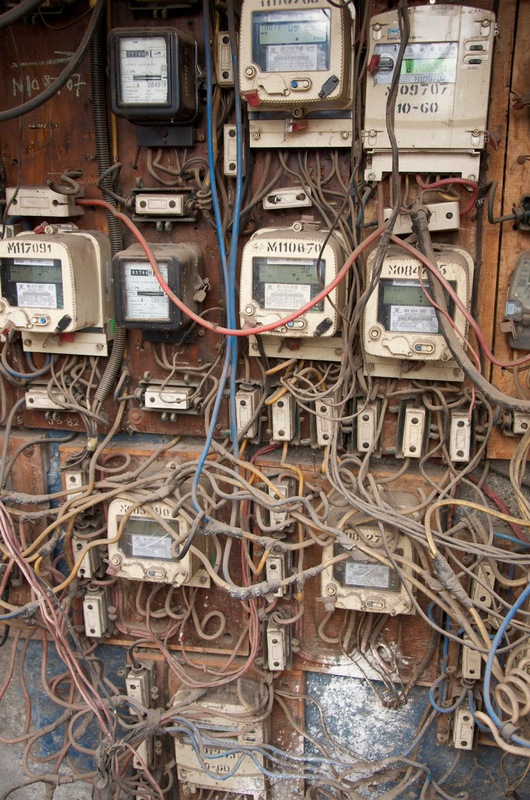 On the way in - this is the electrics cupboard for Dhobi Ghat. Pretty frightening! 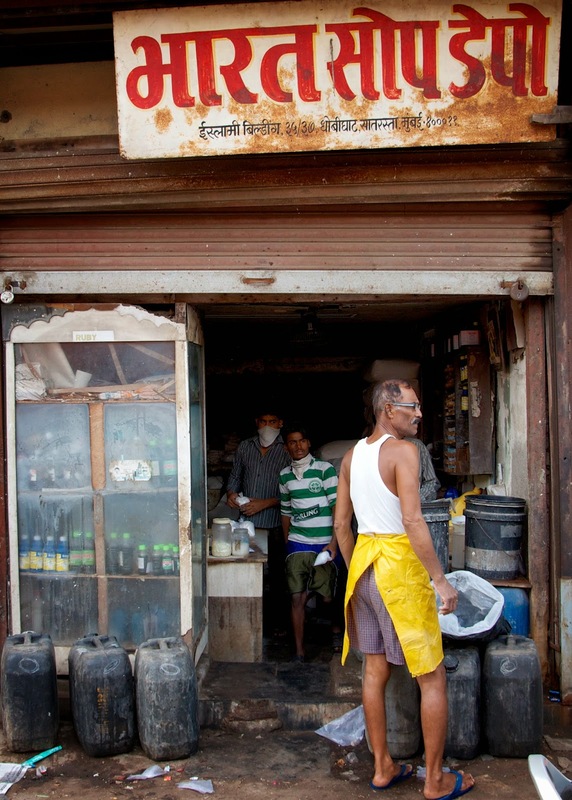 This is the shop where the Dhobis buy their soap. Looks like it could do with a bit of a wash itself! 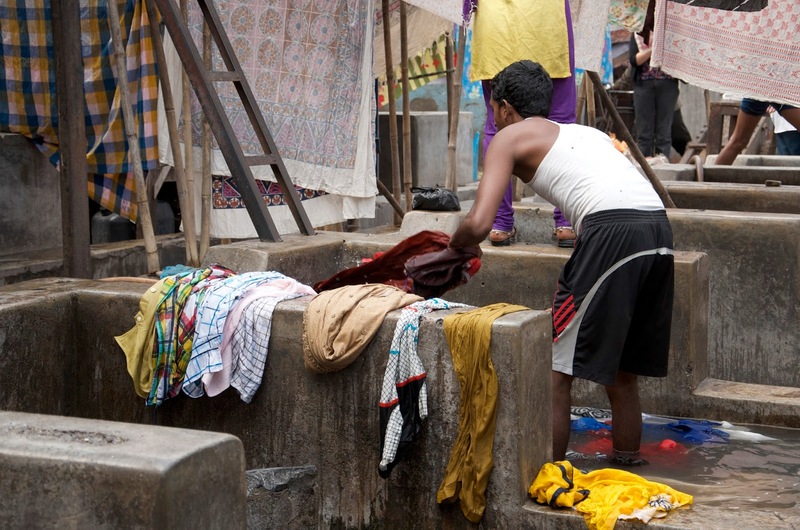 The Dhobi Ghat is now a favourite with tourists visiting Mumbai - in fact it is amongst the top 10 attractions in the city. 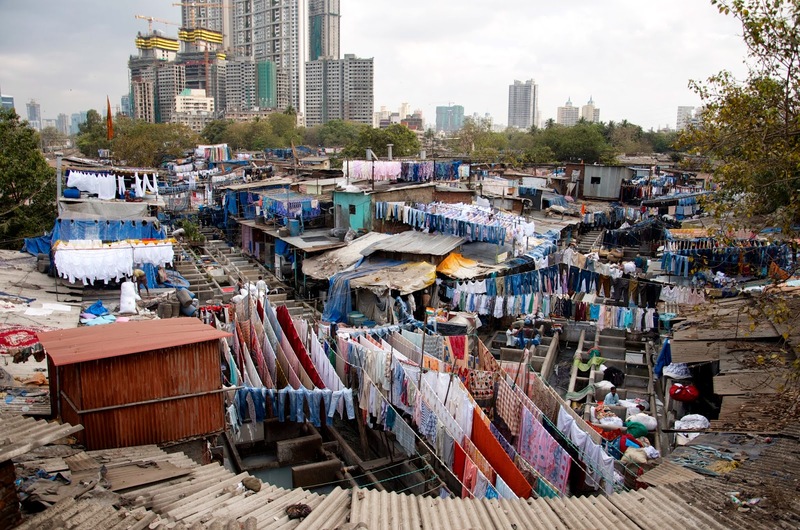 You can easily stand on the bridge next to Mahalaxmi Station and take panoramic photos of the laundry (the first photo is taken from the bridge), but be prepared to be hassled by hawkers selling sequinned bags. You will also see the odd coach load of westerners standing there on the bridge. 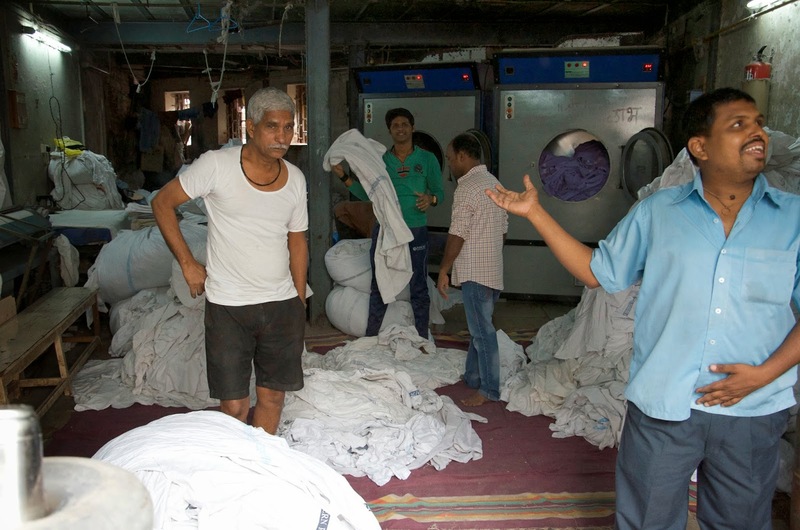 The workers in Dhobi Ghat have latched on to the fact that it is possible to make a tidy sum out of foreigners. So if you go down the stairs and try to walk into the laundry area itself, you will be stopped by a sort of 'agent' (ours was a teenager wearing swanky jeans and sunglasses) who will charge you 300 Rs each to be taken in. And I can't blame these guys - how would you like it if someone was peering at you and taking photos whilst you were working? For our excursion, I added on an extra layer of protection by engaging a Reality Tours & Travel guide - he took us in, did the entry negotiations and accompanied us around the ghats whilst we took detailed photos. Please contact them directly via their website for pricing and availability of tour guides. A group of up to six people is feasible this way. And if you do go - please show these hardworking men some respect whilst they are working, by not getting in their way and being aware of porters rushing in and out with heavy loads. 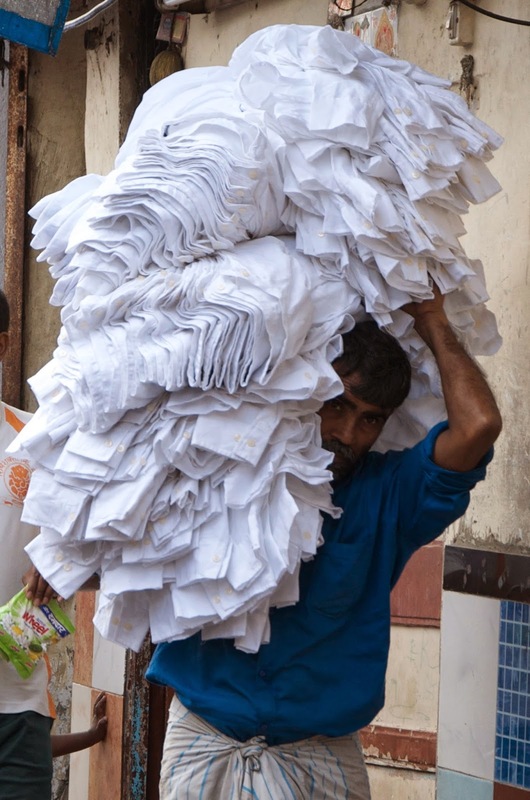 Everybody talks about the 'Dhabawallas' managing to deliver all those 'tiffins' every day without any mistakes and their unique 'coding' system that determines the owner/destination. 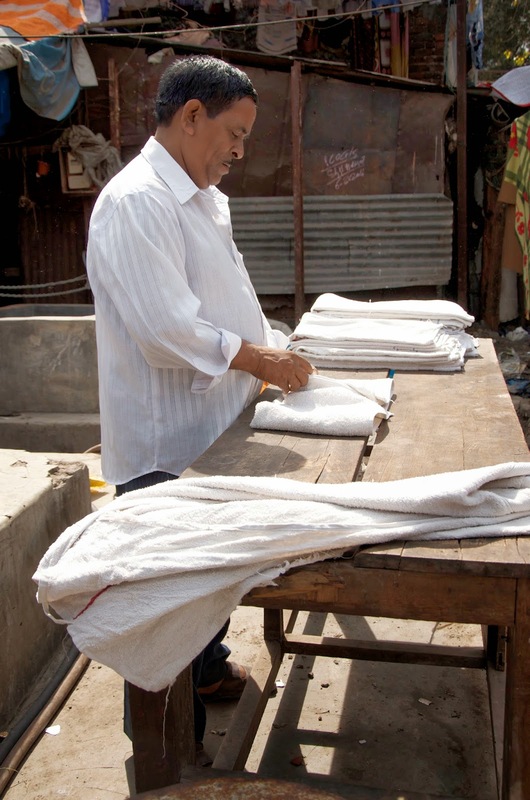 But what about the 'Dhobiwallas' - they probably have a similar system since the washing is being received from all parts of the city. Hello - yes they do have a coding system too although I failed to take a photo of it - they use little scraps of cotton marked with indelible ink to signify owner and destination. And I am sure, just like the dabbawalas, they make very few mistakes! 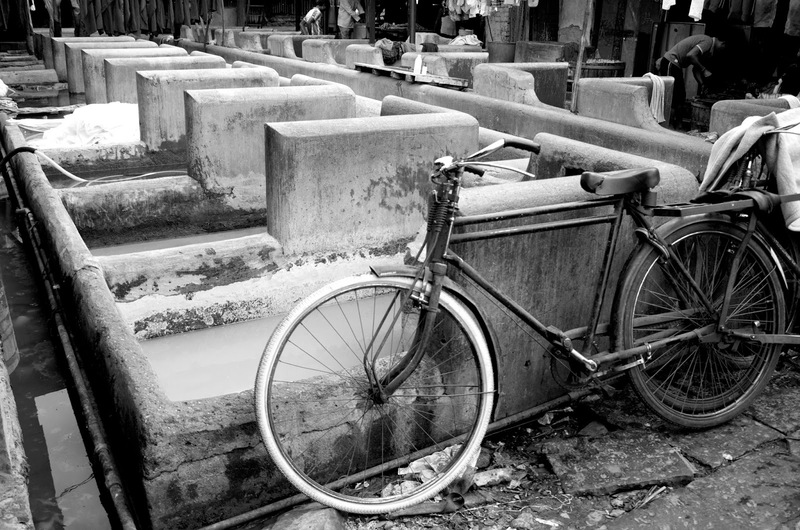 See my Dabbawala post here: http://bombayjules.blogspot.in/2013/03/the-mumbai-dabbawalas-dabba-dabba-do.html Thanks for checking in! An interesting read. Thanks for sharing. Cheers.